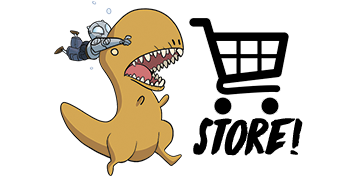 The Kickstarter campaign for Atomic Robo and the Temple of Od is chugging along. You guys knocked out a couple stretch goals already, let’s see how far you can push it! Meanwhile the hardcover edition of Atomic Robo and the Ring of Fire is now available in our online store. You can also grab The Plush Head of a Robot Named Robo. And the ULTRA Field Manual in either paperback or hardcover format. Or there’s the Official Tesladyne Polo why not. December 15th is the cutoff for domestic orders to arrive by the jolly holiday. Except for these shirts, their cut off is December 5th. And November 30th is the cutoff for international orders. We’re running a Kickstarter campaign to make a hardcover edition of Atomic Robo and the Temple of Od along with Real Science Adventures: The Flying She-Devils: Raid on Marauder Island. And we thought, y’know, as an Atomic Robo reader that might be the sort of thing you’re into. Check out the campaign for our rewards and upcoming stretch goals. You can get the hardcovers, exclusive prints, original artwork, or just digital copies. Spectre of Tomorrow and more! Things are gettin' weird as we step into the third issue of Atomic Robo and the Spectre of Tomorrow. Pre-ordering Atomic Robo comics from your local retailer is a great way to make sure we can keep creating them! Or behold the following links if you'd prefer to do your pre-ordering from the comfort of your own home. ARSoT #1 also available online. ARSoT #2 also available online. ARSoT #3 also available online. ARSoT #4 also available online. Or there's always comiXology if that's your thing. Our latest Kickstarter rewards are finally out the door. We'll have The Plush Head of a Robot Named Robo and hardcover copies of Ring of Fire in the online store soon. and Meanwhile you can get all sorts of behind the scenes action over at our Patreon. Hope to see you there! Hope you’re enjoying Atomic Robo and the Spectre of Tomorrow. Apologies for the black and white pages. But surely it's a semi-interesting glimpse into our process? Regardless we should have everything back in full color for you soon. Maybe one more week? You can make it. You can pre-order the first three issues from your local retailer right now. Behold! We added a couple new shirts to our store. Tesladyne Gear and ULTRA Eye. They come in a variety of sizes and colors. Perhaps there is a nexus of these variables and your money. Our Patrons got early access to these new items. That is but one of the several perks available to them for being the best looking and smartest people in the world. Oh, and Scott and I are gonna make an appearance at this little show up in NYC next week. Come and check it out. Something Something Comic Con? Anyway we’ll be somewhere between N1 and N3 in the newly revamped Artists Alley. Hope to see you there. You may have noticed today's page is black and white. If you didn't, uh, see a doctor. Long story short: we screwed up. If you want to ge specific I screwed up but let's not get bogged down in pointless details, hmmmm? We had a choice to toss a million pages at Anthony with an impossible deadline to color them or to put a hold on uploading pages for a while. These were dumb choices. So we figured, what the heck, let's just upload the pages without colors and that way you guys still get content without killing anyone behind the scenes. Win-win! We'll replace these with color versions when they're ready. Meanwhile! You can pre-order both the first and second issues of Atomic Robo and the Spectre of Tomorrow. Head to your local comic shop or grab 'em from your favorite online store. As usual comiXology versions will be available day and date with the print versions. Same for Real Science Adventures! 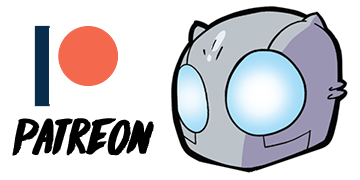 As usual, if you'd like to support Atomic Robo by throwing money at us but you aren't into owning individual issues, you can always check out our online store. Or show your support directly by joining our Patreon and in return you'll get all kinds of bonus stuff like early access and behind-the-scenes goodies. More Pre-orders, More I Say! You can now pre-order both the first and second issues of Atomic Robo and the Spectre of Tomorrow. Head to your local comic shop or grab 'em from your favorite online store. As usual comiXology versions will be available day and date with the print versions. Atomic Robo and the Spectre of Tomorrow #1 is now available for pre-order at your favorite local or online shop. It will be published in October so by the time it comes out you’ll have read a couple issues for free via our electric website machine. Do you want your letters to appear in the print issue? Just send them on over to asktesladyne@gmail.com and we can make it happen through an alchemical process best left undisclosed for safety reasons. A super fun and cool way to support Atomic Robo is to buy the issues in print (locally or online) or digitally. Or maybe grab the trade paperback or hardcover collections to decorate your bookshelves. Or show your support directly by joining our Patreon and in return you'll get all kinds of bonus stuff like early access and behind-the-scenes goodies. Remember those carefree days when the world was only imperiled by things like giant mutants from the sea or the occasional mad scientist dinosaur? Now it's 2017 and everything's horrible all the time! But that's why Atomic Robo is setting up the new Tesladyne Institute in the badlands of New Mexico's Jornada del Muerto desert with Sir Richard Branson's Spaceport on one side and Elon Musk's Solar Farm on the other. With neighbors like these, who needs to uncover an insidious plot that threatens the lives of everyone in the world? The Diamond Order Code is AUG170529. That can be handy when ordering it from a local shop just so they don’t have to track it down themselves. FREDCON is a one-day show up in Fredricksburg VA this weekend. And Atomic Robo's gonna be there! The doors are open from 10am to 7pm Saturday July 15th only. The whole thing goes down at the Spotsylvania Mall. Be there or be, uh, I dunno, somewhere else. It's your life do what feels right. But if you come by, which you obviously should, we'll have some books and prints and a general selection of knicknackery. Connecticon 2017 here we come! Consider this your final warning, Hartford. Scott and I will be at Connecticon 2017, July 6 - 9. Don't call it a comeback, we've been here for years! Just not for a few years. We'll have floppies for Temple of Od, hardcovers of almost everything else, and whatever doodads we can shove into our luggage. Scott has opened up his commission list for the show. All you got to do is PayPal fifty Earth dollars ($50) to scottwegener@gmail.com, tell him what you'd like SINGLE FIGURE ONLY and then come pick it up at the show! We'll be in the Online Media section on the Exhibition Floor with all the other cool internet people. Been a while since I did one of these. For shame! But, hey, I was writing more comics, so that's a pretty good excuse, right? DermalAbyss is an ink that reacts to body chemistry. Anyway, long story short, interactive tattoos. 16 Psyche is an unusually iron rich asteroid. Like 10 quintillion dollareedoos rich. Which is, for the record, more wealth than has been produced in all of human history combined. Just another reason to get serious about the Interplanetary Transport Network. Also, y'know, not turning the Earth into hellscape. WALLABY is a telescope array that was already collecting 15 terabytes per second when it was only one-third finished. The rest of the antennae ought to be installed later this year. MetaLimbs will turn you into a cyborg! Whoops, too late. I take the perhaps absurd view that we're already cyborgs. Yeah, that's right, all of us. How’s that? Well, we’re not used to thinking of memory, language, or culture as technologies, but they had to be invented and our use of them has vastly expanded the horizons of human ability. But, still, robot arms would be a welcome addition. Strange Science posts are brought to you by The Best People in the World.